Basketball is a non-contact team sport played on a rectangular court by two teams of five players each. The objective is to shoot a ball through a hoop 18 inches (46 cm) in diameter and 10 feet (3.048 m) high that is mounted to a backboard at each end of the court. he game has many individual techniques for displaying skill—ball-handling, shooting, passing, dribbling, dunking, shot-blocking, and rebounding. 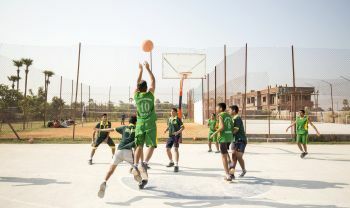 Basketball teams generally have player positions, the tallest and strongest members of a team are called a center or power forward, while slightly shorter and more agile players are called small forward, and the shortest players or those who possess the best ball handling skills are called a point guard or shooting guard.